All About Sports Cards: A First Look at 2010-11 Panini National Treasures Basketball. These cards are amazing! 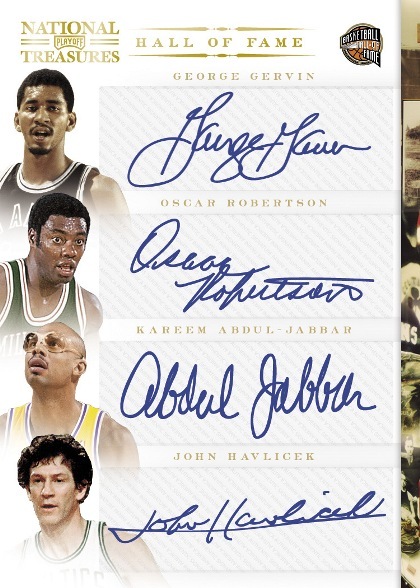 A First Look at 2010-11 Panini National Treasures Basketball. These cards are amazing! For sports fans this is an exciting time. Yeah, there is Baseball, UFC bouts have been surprising, NASCAR races are being decided on the last lap and the Stanley Cup Finals is proving to be a real battle. But it's the NBA Finals that have providing tremendous games, making Basketball, arguably, the most exciting sport out there now. Adding to that excitement is a Sneak Peek of 2010-11 Panini National Treasures Basketball. The National Treasures Basketball release for 2009-10 won the All About Cards 2010 Sports Card Award for Best Ultra Premium Cards, so you know that we have been waiting with great anticipation for this year's release. But even in an award winning, high end product like NT, there are cards that are best served to make trade bait for a friend's Personal Collection. By the looks of these cards, you won't want to share them with anyone. Kind of like watching the Slam Dunk Contest, just when you think you've seen the best, another even more impressive card comes along. Here's a few examples. No "Frankencut" here. 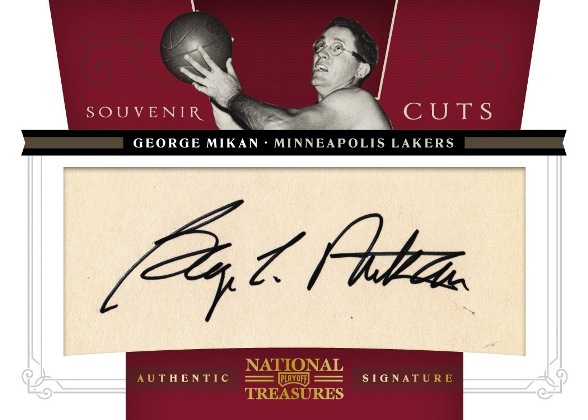 This George Mikan cut is a beauty. 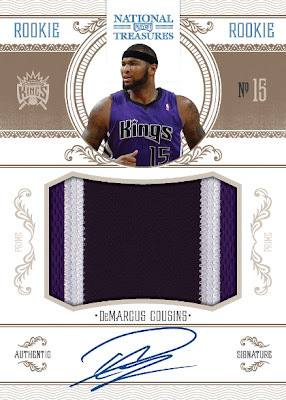 This is a great layout and a sick patch on this DeMarcus Cousins card. Gotta love this nickname auto from David Robinson. Yes. 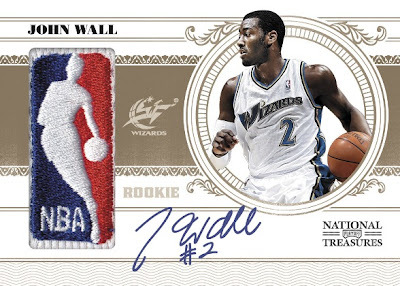 Logoman patch and red hot auto from John Wall. 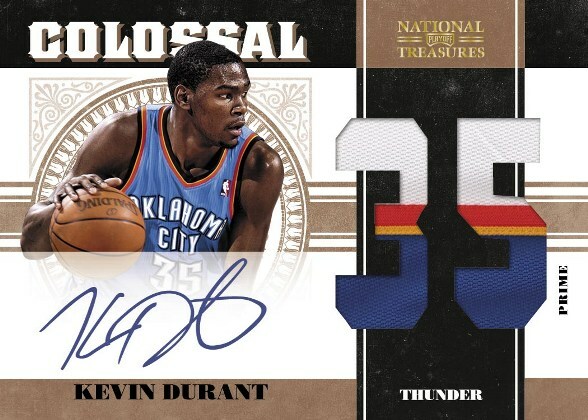 Aptly named this Kevin Durant Patch/Auto is Colossal. 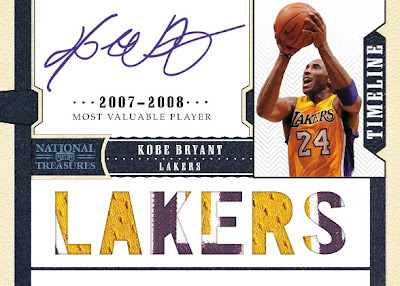 Panini and Kobe Bryant, they work well together. Another prime example. 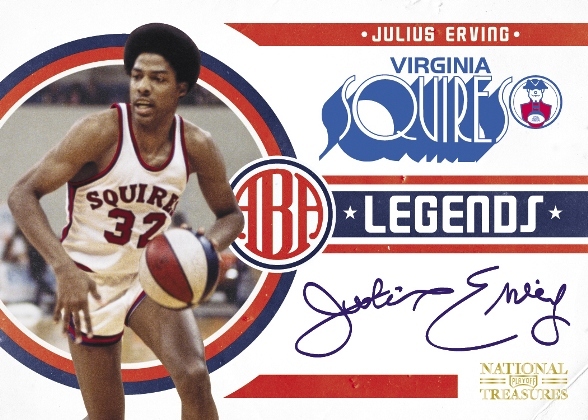 Dr J. Julius Erving is his ABA glory. Awesome card! 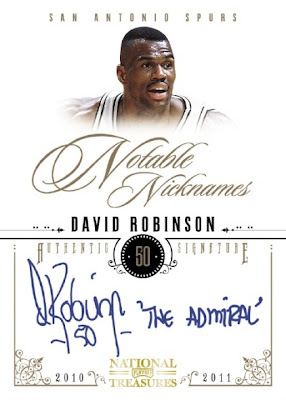 This one makes me pine for last year's Hall of Fame release. George Gervin, Oscar Robertson, Kareem Abdul-Jabbar and John Havlicek. Enough said. There are more cards to look at and a bunch of information about the release including a listing of the insert cards over at The Knight's Lance. Use this link to check it out.